Share the post "The Center for Human Health and Performance, an Rx for Life"
Michelle Arent, director of training and conditioning at Rutgers Center for Health and Human Performance (CHHP), working with a client. Did you join a gym at the beginning of the year or start a diet? How is that working out? The scale hasn’t moved that much, your clothes seem to fit about the same and you really aren’t feeling that much more energetic. Why? You’re there three to five times a week. You’re on that elliptical for an hour at a time. What are you doing wrong? “It could be a lot of things,” said Michelle Arent, director of training and conditioning at Rutgers Center for Health and Human Performance (CHHP) at the New Jersey Institute for Food, Nutrition, and Health (IFNH). Drastic changes that occur quickly are very often short-lived. Instead of trying to reach your goals ‘by tomorrow’ you need to focus on the big picture and adopt changes in exercise and eating that become ‘good habits’. When you do that you’re guaranteed success. That is what the Center for Health and Human Performance is all about. The CHHP is not a gym, though it certainly looks like one upon first inspection. First and foremost it is a research facility dedicated to improving health and performance of athletes and everyday people. Whether it is hands-on research, or every day application of evidence-based exercise prescription, CHHP staff are equipped to aid youth and professional athletes, as well as weekend warriors and the general population. It makes no difference if your goal is achieving a competitive advantage or simply improving health and every day function – the prescription will begin with an assessment. The first step in any assessment is to determine body composition. Shawn Arent, associate professor-Department of Kinesiology and Health, and director-CHHP, assisting student Mariisa Bello, Exercise Physiology ’17 in the Bod Pod. Instead of simply using a scale to determine body mass or weight, CHHP uses the “Bod Pod” to determine how much of your mass is fat mass and how much is fat-free mass. This allows them to accurately track progress. “Regardless of weight, too much fat is too much fat. This is where so many people go wrong. Focusing on making the scale number go down could result in a loss of lean mass, or muscle. When this happens you actually get fatter, not leaner,” Arent explained. Maximizing the loss of fat while preserving (or gaining) muscle is key. When it comes to gaining muscle it is important to have the right resistance training prescription. To determine this, CHHP uses strength testing to ensure optimal loads are used during training. Simply going to the gym and ‘lifting weights’ does not automatically mean you’ll be getting stronger or building muscle. Placing the right amount of stress on the muscle is crucial. Another test that is commonly used is the VO2 max test. This test measures the maximum rate of oxygen consumption during exercise. It is an indicator of cardiorespiratory fitness and basically tells you how much oxygen gets delivered to your working muscles. Since this is strongly correlated with longevity, the higher the VO2 max, the better. Shawn Arent, left with Michelle Adams testing and Sean Conway on the right. The CHHP offers everything you’d need to build a complete health and fitness program. Intense Cardio Exercise (ICE), Focused Intense Resistance Exercise (FIRE) and a Healthy Lifestyle Class. After receiving your fitness testing results, you’d know which classes would be the best fit for you. “ICE classes are short, with intervals of high-intensity activity that challenge the participant, followed by periods of rest where the body still burns fat. ICE works because it produces a unique metabolic response, facilitating fat loss and improving exercise capacity.” And it can be achieved in as little as 30 minutes, a bonus for all of us time-challenged people. “Resistance exercise (CHHP’s FIRE) is the only non-surgical way to change the shape of your body, as it’s specifically designed to build muscle,” emphasized Arent. As a matter of fact, adults between the ages of 40 and 80 can lose as much as 30-50% of their muscle mass. When you lose that much muscle you start having problems like standing up from a chair, getting out of the bathtub or going down stairs. Muscle loss doesn’t just make activities of daily living more challenging; the concomitant muscle loss and fat gain that typically occurs also increases risk for cardiovascular disease, type 2 diabetes, and some cancers. Resistance exercise will help with all of these issues as well as combat obesity and osteoporosis and it is much better than having to take multiple medications or being fearful about falling. You can talk about exercise all you want, but there is no denying the impact that the food you eat has on you. Which brings us to that word ‘diet,’ a dirty word for many. Arent prefers to think of it as a healthy lifestyle. Crash diets and quick fixes aren’t fixes at all. They may produce rapid results, but they are very often short-lived and leave you in a worse position that when you started. CHHP’s Healthy Lifestyle Classes focus on sustainable behavior change. “The only way to permanent change is through permanent change,” Arent said. The class covers everything from metabolism, to turning good intentions into lifelong habits. It really is logical and straight-forward Arent says. Anyone can benefit from learning about how food impacts his or her body. The client, who was a bodybuilder, was being treated by a doctor for diabetes and was on medication. He had come to CHHP to improve his performance as a body builder. CHHP had his body composition calculated and the bodybuilder learned what happened when he consumed certain foods at certain times. This helped him to better time his carbohydrate and protein intake, allowing his body to better deal with them. At his next doctor’s appointment his doctor inquired if he had stopped consuming carbohydrates, as his bloodwork showed drastic improvements. Needless to say, he was quite surprised to learn that carbohydrates were still a big part of his daily diet. His doctor recommended that he continue with the changes he had made to his daily nutrition and to discontinue the use of his medication as long as he was maintaining these new eating habits. Most of us are not bodybuilders, but learning these things applies to everyone and may just be the ‘prescription we all need’ to live the healthiest, longest life we can. And, maybe fit into that bathing suit you’ve been eyeing in the store. 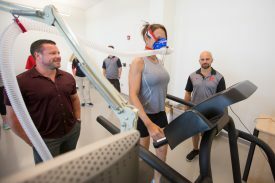 Learn more about ICE, FIRE or Healthy Lifestyle Classes, or schedule a consultation with the Director of Training and Conditioning by emailing chhp.training@sebs.rutgers.edu.